Fried chicken and whisky? Yes please. Last week at London Cocktail Week, we were reminded just how fun it was to work behind a bar. Before getting into the digital marketing and fashion industry, we both worked multiple jobs between the nightclub and small bar scene to get us through university. Being fans of socialising, aaaand the odd alcoholic beverage here and there (guilty as charged), we found ourselves quite at home shaking the tins in a bustling, fast-paced environment. Nine months on, we haven’t stepped foot behind a bar since leaving Australia to move here to London. And while we never thought we’d say we missed those long, tedious nights spent wiping down sticky surfaces ’til 6am, last week’s LCW pop up had us feelin’ some serious nostalgia. The Cocktail Village pop up offered a total of 40 amazing and immersive bars, each serving cocktails at an absolute steal of a price: £6. We were in cocktail heaven. Just about every single one of our fave global spirit brands was involved, including Beefeater, Talisker, Tanqueray, Monkey 47, Don Julio, Ketel One, Monkey Shoulder, St Germain and so many more. Global brands aside, the smaller scale guys were also serving up the goods, with distillers like Kyro and Roe & Co showing us how it’s done. The pop up stretched throughout the iconic Old Truman Brewery function space, with three huge spaces and even a secret hidden VIP bar by Fever Tree (to which we enjoyed the pleasure of many cocktails). Two of our fave hangout spots were the St Germain and Kyro pop-ups, both for the quirkiness and originality of their set-ups. 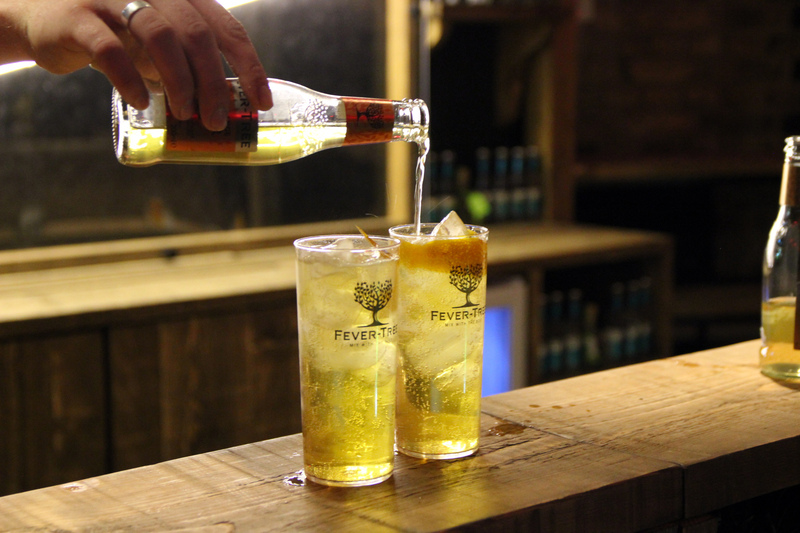 The delicious elderflower drop, St Germain, set up their bar in the most unconventional way. In fact, you couldn’t even see a bar at all. The pop-up was simply a floral-covered vine wall (names the “living wall”, with nothing but a fanciful hostess to guide you through what to do next. As we gave her our drink token, she instructed us to wait by this particularly mysterious looking hole in the floral wall, and within seconds a hand popped out presenting our cocktail (giving us a near heart attack while it’s at it). We walked off enjoying a fresh and flowery elderflower spritz. 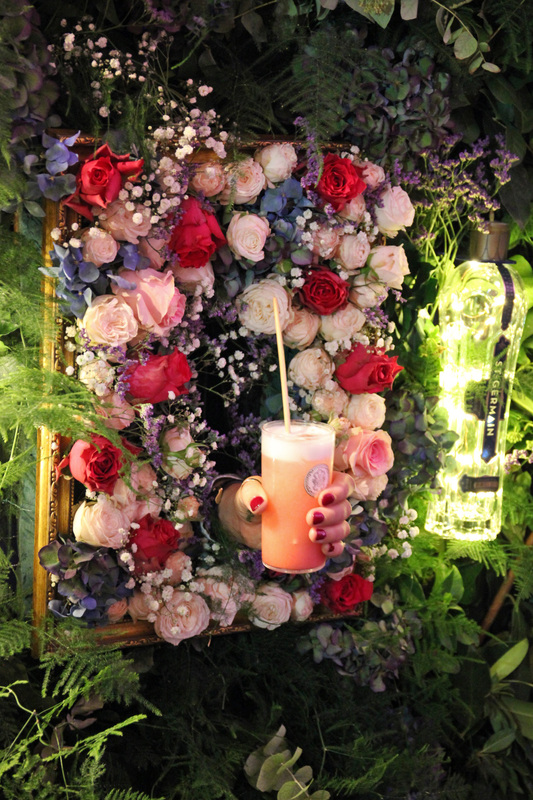 St Germain’s cocktail-serving flower wall. Kyro had set up a sauna, although we never went inside, so are unsure as to whether or not it actually heated up (haha). Guests were given white bathrobes, seated inside a very intimate, tight wooden box and then were entertained by the likes of an inevitably naked bartender. To our knowledge, they were holding masterclasses inside, so we were pretty sad we missed out! However, we did get the chance to enjoy a taste of their Napue rye gin. Special mentions must go to Southern Comfort for the unlimited fried chicken, cocktails and shots, and to Ford’s Gin for being so accommodating with the martinis and oysters (courtesy of E8 Fish). 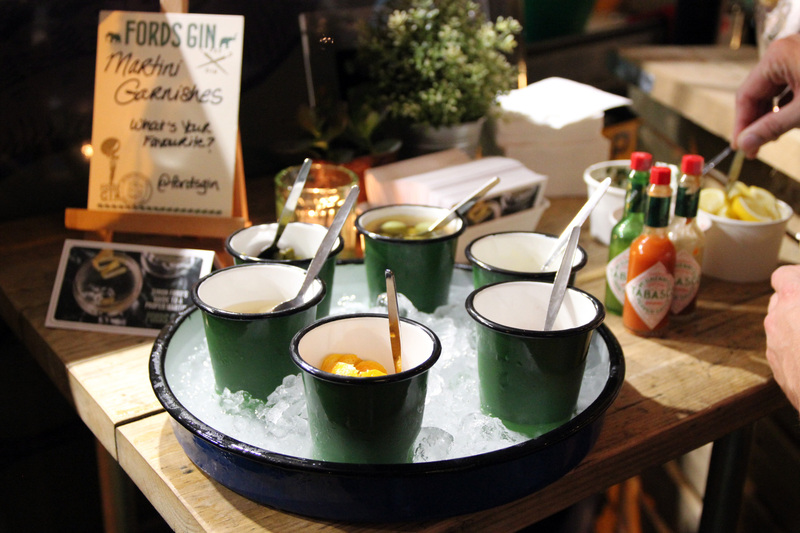 We particularly loved the stations set up at Ford’s, featuring two different garnish stations: one for your martini and one for your oysters. What’s better than a garnish bar for your martini? Another final mention goes out to the wonderful staff and bartenders who totally rocked their pop-ups. Each bartender we spoke to was enthusiastic, knowledgeable and totally down to have a cheeky shot or two with us, which reminded us exactly of how we used to be behind the bar. It seemed as though everyone working there was feeding off the good vibes of their neighbouring bars, creating an all-round excitable environment for everyone involved. These guys were really what made this event so memorable for us; we had such a great time, we even made sure to come back and visit some of them a second time. That being said, we’re also coming back next year without a doubt. If you’re a fan of delicious drinks, food and all ’round good times, we highly suggest you pay LCW a visit next year, too!